The work recently shown in VOLTA is a continuation of Chamberlin’s last exhibition Fill Me Up. 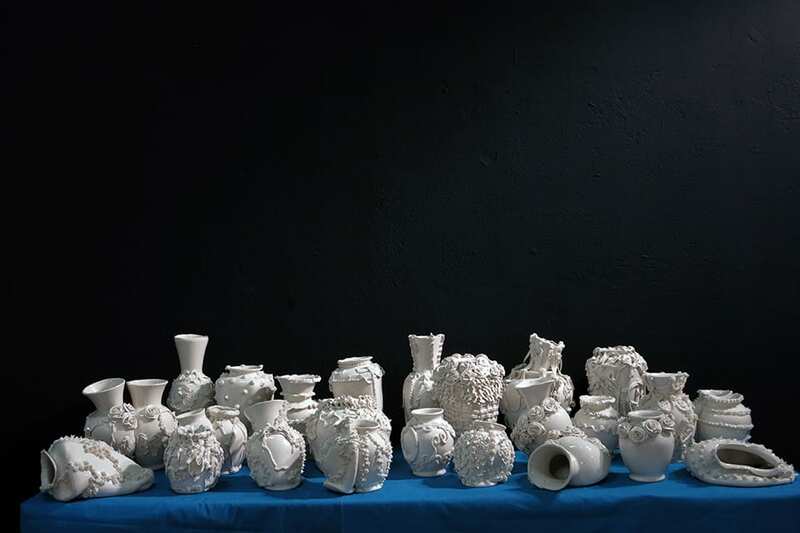 The exhibition featured a series of 108 heavily decorated porcelain vessels were displayed exploring the theme of desire. 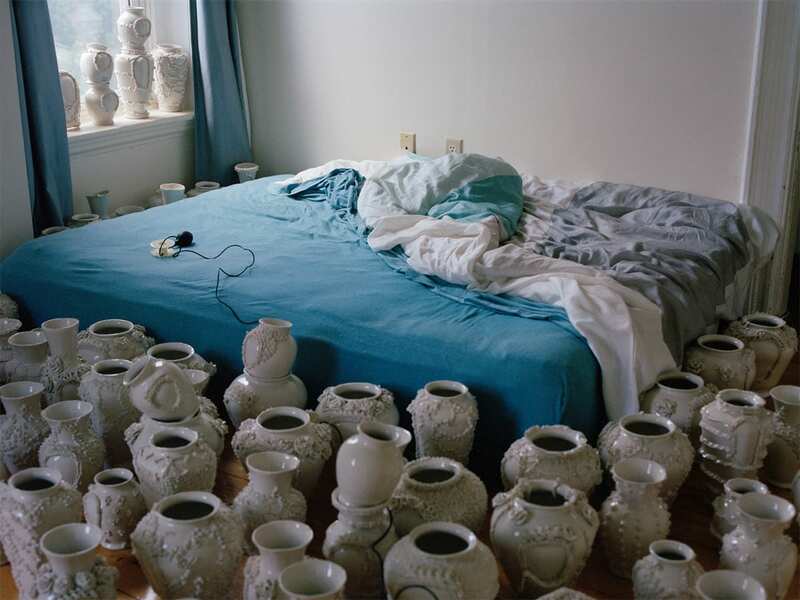 The artist’s concept of desire is explored through the titling of pieces; where some empty vessels are given specific names, others are accompanied only by a number. These names represent past objects of the artist’s desire, either living in his imagination or being present in reality. The material of porcelain itself signifies desire; Europeans were so crazed for the material that for years they tried to replicate it but were only able to fashion inferior white clay bodies. It is this white on white facade as well as the blank galleries that invite the viewers to project their own desires filling the empty vessel. 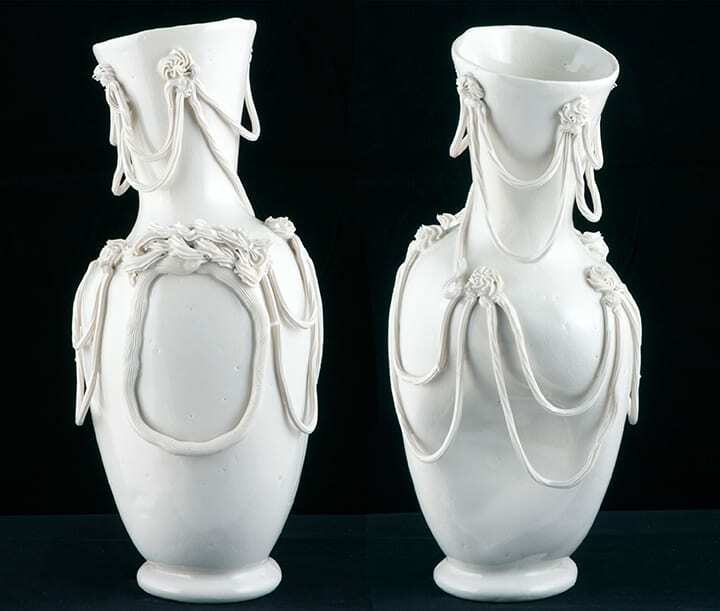 The act of creating these works requires Chamberlin to “fill up” his molds everyday and then pur them out every day to create the shell of a vase. The emptiness of these works leaves space for projection. 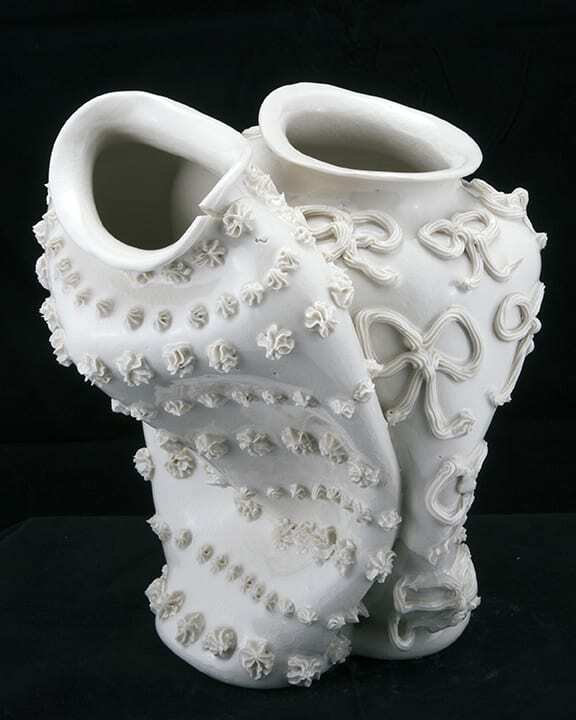 The unique qualities of each case allows them to become personified “individuals.” By thinking about the vocabulary of the vase, neck, shoulder, belly, and foot, each vase comes to have the language of a body as well. This idea is further pushed by Chamberlin’s handling of the porcelain like skin, letting it slump and morph like a human body. 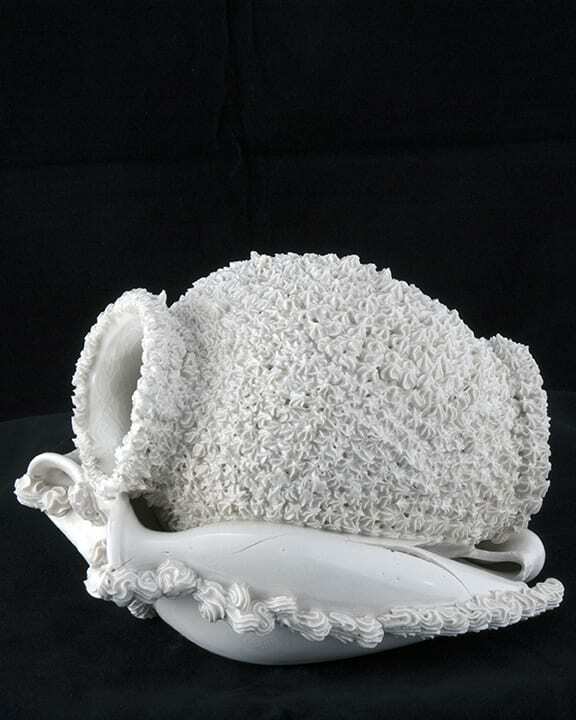 The Forms Chamberlin uses are sourced from large floral online retailers that reference Sevres pottery desired by the likes of Marie Antoinette. Chamberlin’s new work further develops the formal qualities of his previous series while evolving into an auto-biographical expression that explores the elusive idea of relationships. As well as being inspired by his own romantic relationship Chamberlin also draws inspiration from the relationship of Families like the Romanovs and their people. Like the way some of the vessels have been pushed to collapse you could say the Romanovs and many other dynasties have pushed themselves to collapse as well. With these new works Chamberlin creates conjoined vessels that consider the push and pull of relationships. where some vessels seem to have achieved homeostasis, others are less stable and balanced. Each vase is decorated by hand using cake decorating tools and is adorned to create an individual piece with a unique personality. The decoration, inspired by the great jewels and palaces of history, both allude to the opulence and power of the past while also speak of its demise. Some vases unable to carry the weight of their decoration, slump and fall. 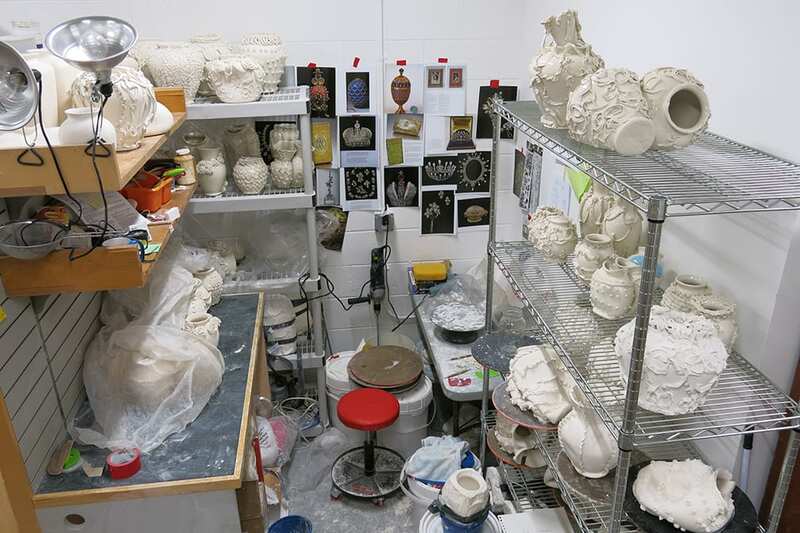 This is a view of my studio currently at Harvard Ceramics. 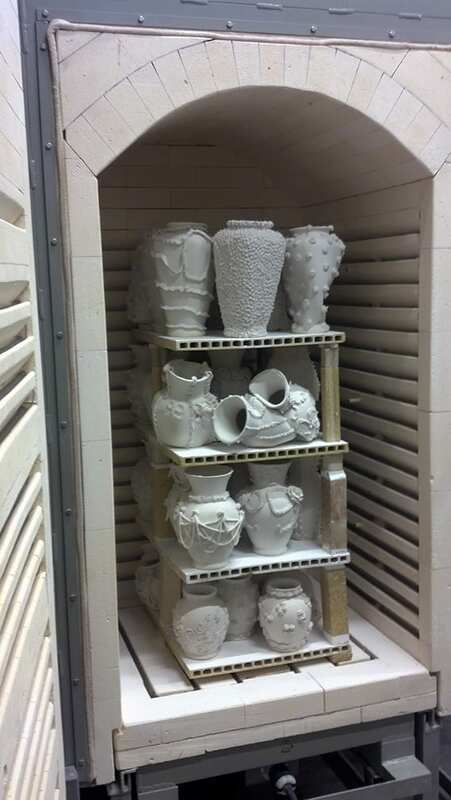 It is a constant shuffle of rotating drying work in and out of kilns and glazing and back to another firing. 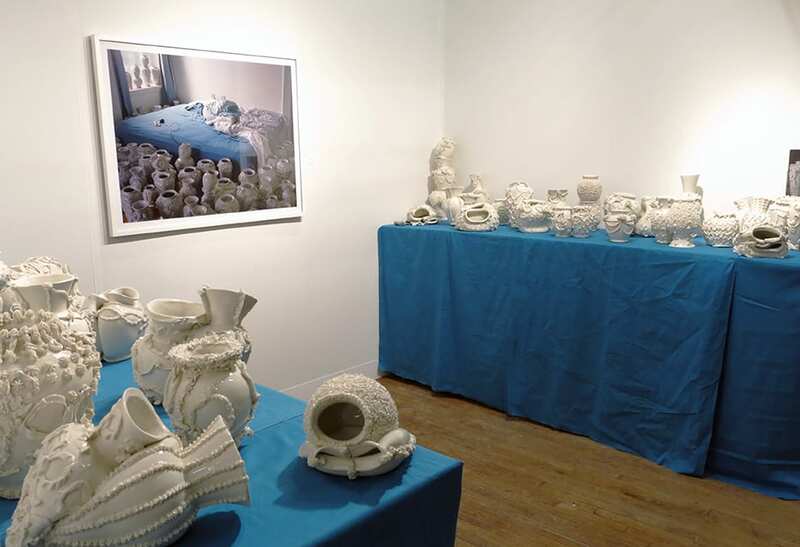  Archived in Uncategorized and tagged Ceramic, Issue 44, Kiln, Marie Antoinette, Miller Yezerski Gallery, Opulence, Robert Chamberlain, Sculpture, VOLTA NY. Bookmark the permalink.